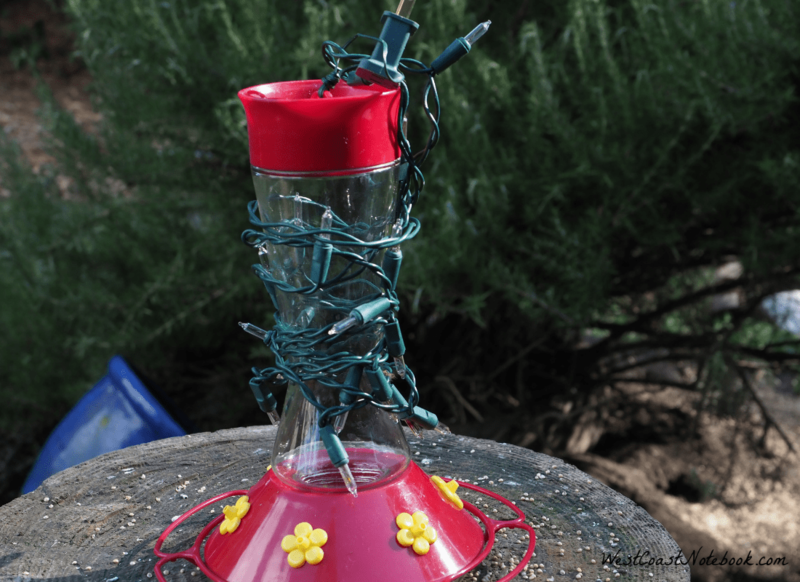 DIY - How To Keep Hummingbird Feeders From Freezing! 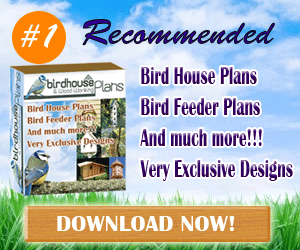 / DIY – How To Keep Hummingbird Feeders From Freezing! We were heading out on holidays for two weeks and the west coast was heading into it’s worse weather in years. It was actually freezing here which is unusual by itself, but now it was going to go down to -7 C (20 F) and I needed to find a way to keep the hummingbird feeders from freezing. While we were home, it’s an easy solution to bring in the feeders at night and put them out during the day. The feeders are under the eaves of the porch so that protects them from a lot from the elements but they would definitely freeze if left out for two weeks without any way to heat them. On the west coast, we have hummingbirds all years round. During the summer there are normally Rufous hummingbirds and Anna’s hummingbirds. The Rufous leave in the late summer but Anna’s stay during the winter as well. 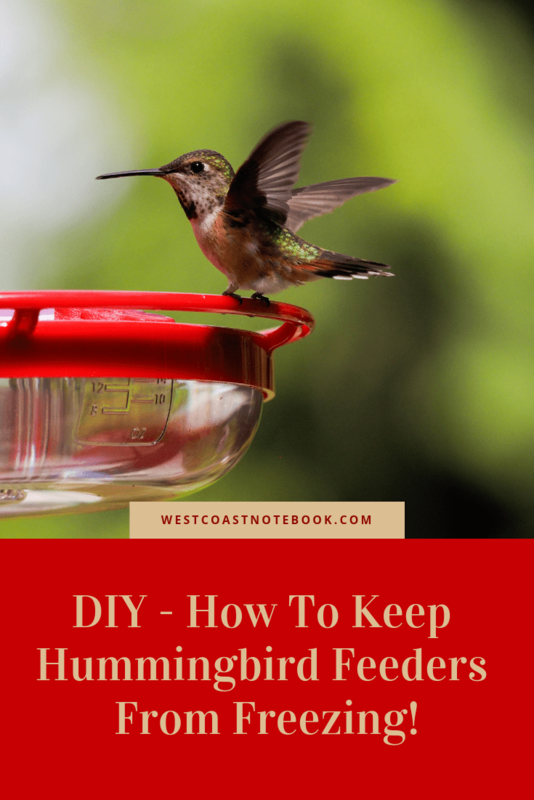 I feed them all year round and in the summertime when they have their babies I sometimes have to fill up the feeders twice a day and put out an extra one. In the winter I feel a certain responsibility to maintain a constant supply of liquid in the feeders as the hummers have come to rely on this food source. Not saying this is their only food source, but it is one of their favourite spots to hang out. Hummingbirds can shut their metabolism down during the night in order to conserve energy. This is a great explanation from The Spruce. Animals, including birds, that enter a state of torpor lower their body temperature and slow their heart rate, respiration and metabolic rate dramatically. This effectively conserves energy because fewer calories are needed to maintain life functions, such as respiration and blood circulation. Metabolic rate can actually decrease up to 95 percent. This type of short term hibernation can help animals and birds survive cold temperatures, and this state is most frequently used on winter nights. Some birds will also enter a torpid state if food supplies are scarce. Torpor is not seasonally dependent, and if conditions are right, birds may become torpid at any time of year. So, when they come out of the torpor state in the morning, they need something to raise their metabolism and the nectar supplied by the feeders make it a good start to their morning. We normally put the hummingbird feeders back outside before it gets light and had hummingbirds appears almost instantly to feed. But… as I mentioned, we were going to be away for 2 weeks and the weather was supposed to be below freezing the whole time. Keep in mind, this was just before we were going to leave and I started to panic. I had one night to test something out to make sure it worked. I had a water heater for the birdbath which you can see here and which Amazon carries or your local feed store might have them. It was all plugged in and working a treat, but nothing came to mind for the feeders. Putting my brain to work I started thinking about what we had around the yard that might work and how I could put that together. Just to give you an idea of what I was looking for, this is what my hummingbird feeders look like. I had read you could use the type of tape you put around water pipes to keep them from freezing but because of its shape that wasn’t an option. Besides… I didn’t have time to go to the hardware store. What I was looking for was something like the heater in the birdbath that the feeder could sit on without melting them. The other problem was is that hummingbirds are very habitual in their actions. Whenever I have moved a feeder either up or down in the same spot they can actually take a while to find it so I didn’t want to move them to a new location altogether. 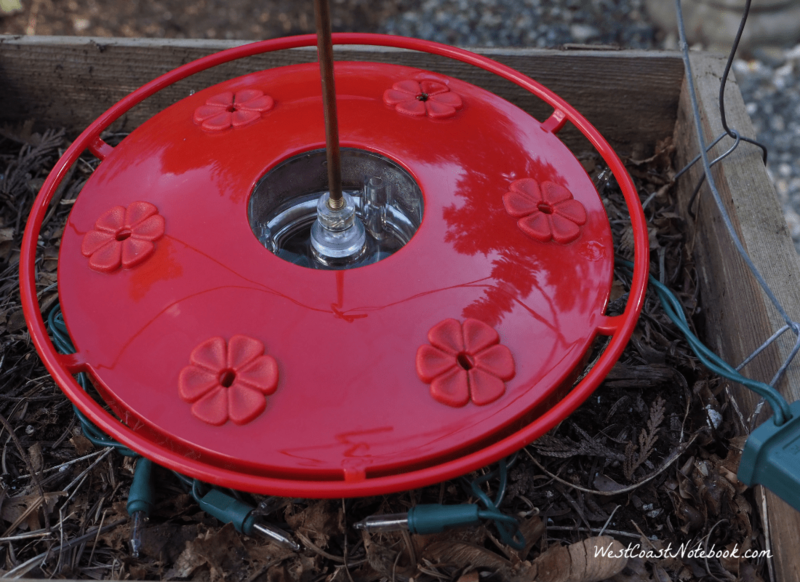 Around the yard, I went looking for items that might just work to protect the feeders from freezing and allow them to stay in the same place. 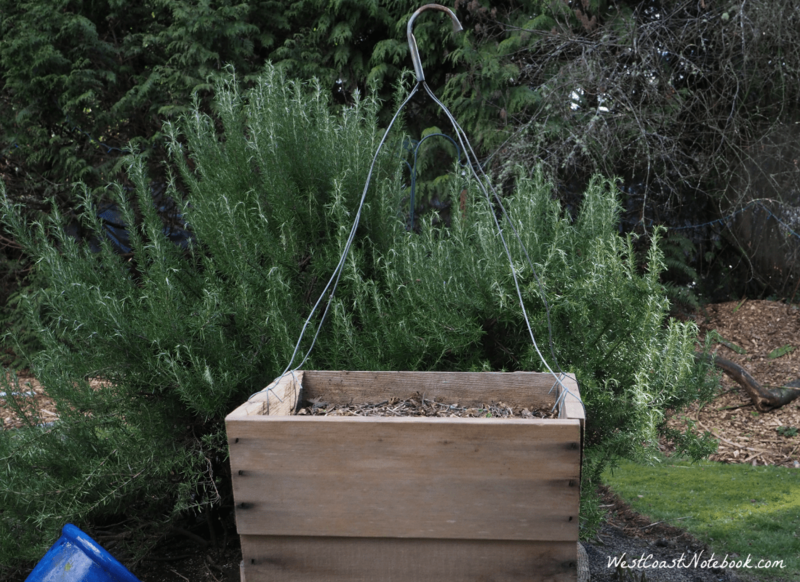 My first aha moment was spotting the old hanging basket from last years petunia’s and I thought this might work to put the feeders into with something to heat them with. But the feeders went down too far into the basket and the hummingbirds wouldn’t be able to reach them. On the other hand, they would cut down on the wind chill. Next, I put a board over the top of the basket but the feeder would have blown off if there was a wind, so I scraped it. But… that gave me another idea. I still had some wooden hanging baskets that I hadn’t taken down that were still full of dirt. Pulling them down off other wall and taking all the dead leaves and plants out of them, I checked to see if the feeder would fit. Perfect fit… and they ended up being just level with the top of the basket so the hummingbirds could feed comfortably. And… when I hung the baskets with the feeders inside them they were in the same spot as if the feeders themselves were hanging. One problem solved… now, what could I use for heat. What if I could use Christmas lights or even better rope lights to heat the bottom of the feeders. So I tried a test with four types of lights. I had to use Tupperware containers for two of the lights as I only had two feeders. Below are the lights I tried which are available on Amazon (just click on the pictures below) if you can’t find them at your local store. I put one on the rope light, another on the LED mini lights, the next on the tape lights and the last on the good old mini lights. The first 3 light were LED lights which apparently give no heat whatsoever and the solution in the feeders froze. 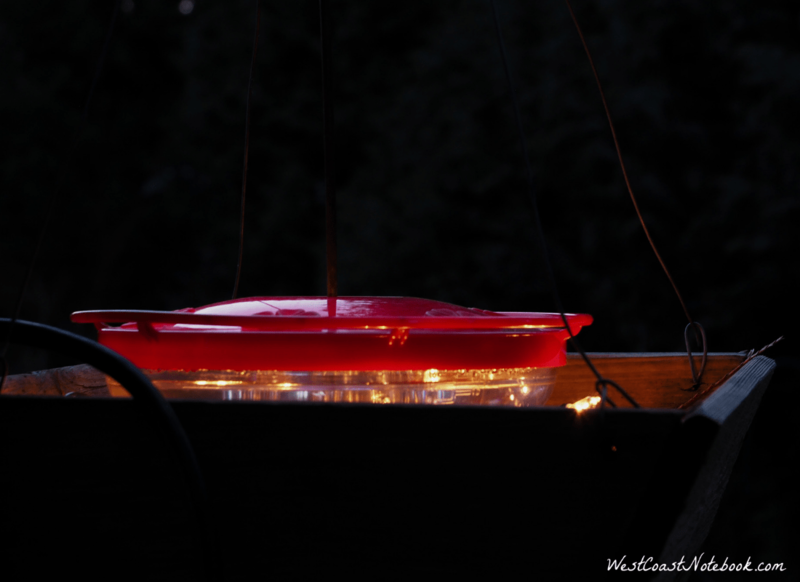 But the good old mini lights worked a treat and come morning the hummingbird feeder that I set on top of the lights was still liquid and there was no sign of being too hot to melt the plastic of the feeder. The solution came none too soon as we were leaving at 4 am the next morning. Rob found me another set of mini lights in his treasure trove of Christmas lights, hooked me up with some extension cords and I assembled my creations. I created a circle of light on which looked like a nest and this kept most of the lights under the feeder. 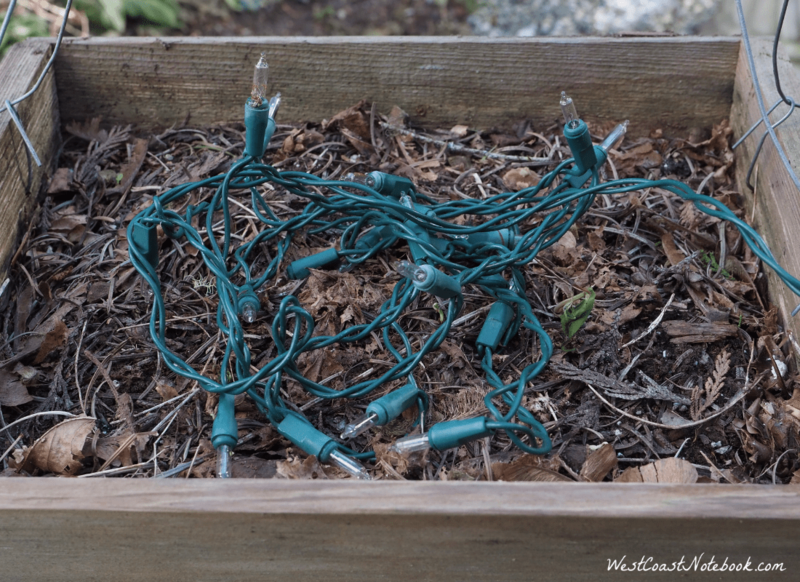 Putting the nest of lights onto the dirt of the hanging basket then topped it with the feeder, they were ready to go. And they worked a treat! It got down to -10 C with a wind chill factor that made it much colder while we were away and the lady who was checking on my birdfeeders said they never froze and the birdbath stayed clear of ice as well. 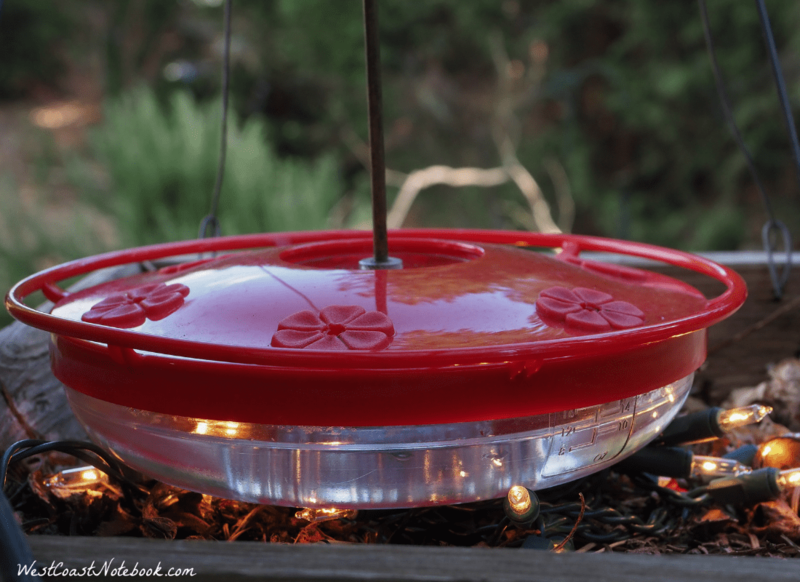 Look around your yard or house for something that will support your hummingbird feeder and will harbour a set of mini lights. In my case, it was a wooden hanging basket full of last years dirt. Sets of mini light (numbers will depend on how many feeders you have). Once I got back from the holidays we were still getting freezing weather at night so I thought I would try it with a differently shaped hummingbird feeder that a lot of people have. This was a little more complicated than my flat feeders as if I just put the mini lights at the bottom of the feeder the glass part holding the liquid would freeze. Knowing that the mini lights produced enough heat to keep the liquid from freezing I decided to wrap the lights around the glass trying to keep the bulbs against the surface as they were wanting to stick straight out. 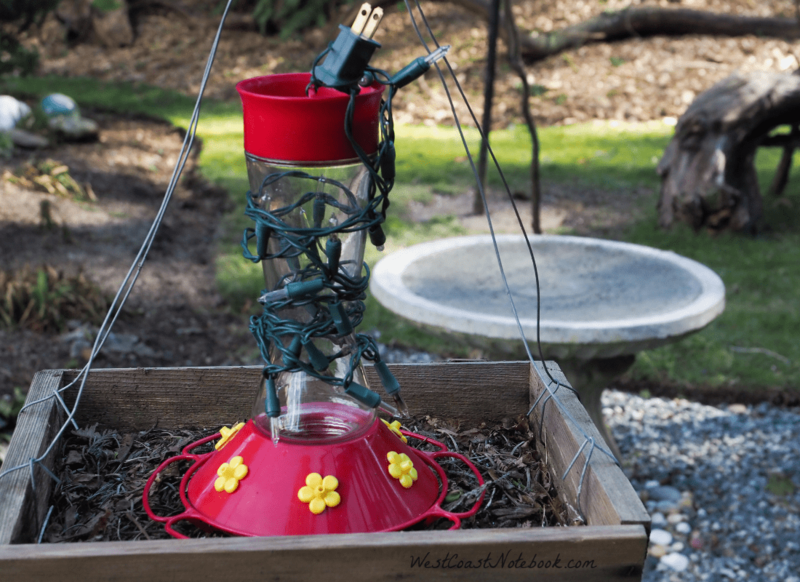 It appeared that this type of feeder would need two sets up mini lights. One for the glass and another for the base. By setting the feeder on the mini lights in the container, this not only kept the liquid in the glass warm but also kept the liquid in the base warm as well. And this also worked a treat! One thing to note with the glass feeder is because it is taller, I would attach it to the container or hanger so it doesn’t topple over in the wind. I can only say that this system worked for me for up to -10 Celcius or 14 Fahrenheit. If you give it a try, let me know if it still works in colder weather? It would be interesting to know just how effective this system is at lower temperatures.